On the heels of the second high-profile mass shooting in two weeks, this one at a bar in Thousand Oaks, California, that killed 12, Democrats in Congress took to social media Thursday to urge -- and plead -- for legislative action. Sen. Chris Murphy, the Democrat from Connecticut who represented the state in 2012 when a shooter at a Newtown elementary school killed 20 children and six adults, said his congressional colleagues are "blind" and silence on gun violence is "unconscionable." "None of it is inevitable. WE CAN STOP ALL THIS," he wrote. is interpreted as endorsement by madmen contemplating mass violence. None of it is inevitable. WE CAN STOP ALL THIS. 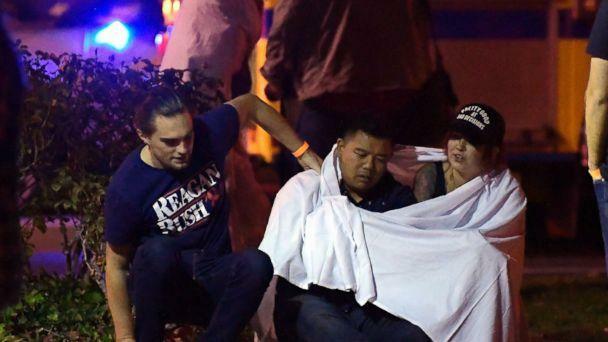 In the latest massacre, at a country bar's college night late Wednesday in a Los Angeles suburb, a lone shooter burst in tossing what appeared to be smoke bombs and firing dozens of rounds, witnesses and authorities said. Ventura County Sheriff Sgt. Ron Helus, a 29-year veteran who was one of the first on the scene, was among the dead, according to police. The suspect, 28-year-old Ian David Long, was also found dead inside the Borderline Bar and Grill, police said. It came less than two weeks after 11 people were killed at the Tree of Life synagogue in Pittsburgh. The oldest victim, Rose Mallinger, was 97 years old. President Donald Trump, who called the California shooting "terrible" in a tweet Thursday morning, ordered flags be flown at half-staff until Saturday at sunset as "a mark of solemn respect for the victims of the terrible act of violence" in response to the shooting. Trump also commended the "great bravery shown by police" and said Helus, the first officer to enter, was "shot numerous times." Helus, survived by his wife and son, was looking to retire next year, the sheriff's office said. As has become customary after mass shootings, many Democrats joined Murphy in calling for an end to gun violence. Senate Minority Leader Chuck Schumer said Thursday's shooting was "yet another reminder of the scourge of gun violence that has plagued America for far too long." "We must act to stop it," Schumer tweeted. Our hearts go out to the victims, their families, and the brave first responders in Thousand Oaks. Our prayers are with the survivors for their recovery. This is yet another reminder of the scourge of gun violence that has plagued America for far too long. We must act to stop it. Sen. Kirsten Gillibrand, D-N.Y., said she was "devastated to wake up to another horrific mass shooting." "When will enough be enough? We must act now," she tweeted. It’s devastating to wake up to another horrific mass shooting. My heart breaks for the victims and families, the first responders – one of whom was killed trying to save lives – the community of Thousand Oaks, CA and our nation. When will enough be enough? We must act now. "This cannot continue," said Sen. Elizabeth Warren, D-Mass. "Congress must move to #EndGunViolence – now." Late last night, at least 12 people died in a mass shooting in a California bar – including a police officer. My heart goes out to the families of the victims and those wounded. This cannot continue. Congress must move to #EndGunViolence – now. House Majority Leader Kevin McCarthy, one of the first Republicans to speak out on the shooting, represents a district north of Thousand Oaks, Calif., where the shooting occurred. "These acts of violence test our unity as a nation. But they will only strengthen our resolve to heal the wounds in our society and move forward," McCarthy said. McCarthy is a longtime friend of Republican Rep. Steve Scalise, who was among the victims shot at a GOP baseball practice in June. Vice President Mike Pence also weighed in Thursday morning. "Our hearts are with the victims, survivors, and their families. A heroic sergeant was killed. We commend the action of all first responders," Pence tweeted. ABC News' Karma Allen, Justin Doom and Emily Shapiro contributed to this report.